Newport manager Terry Butcher says his side will benefit from a week's training as he aims to iron out the "naivety" in their early-season play. Butcher's side are without a win in League Two following a 3-2 defeat by leaders Leyton Orient at Rodney Parade. And with no midweek game, Butcher says they can work on cutting out mistakes. "The week will give everyone the chance to refocus. And it'll be nice to have a week where we don't have to travel on a Tuesday and play a game," he said. "After Plymouth [on Saturday] we've got three homes games on the spin. The players love playing at Rodney Parade and the fans like what they see and we want to get the results for them as much as for us." 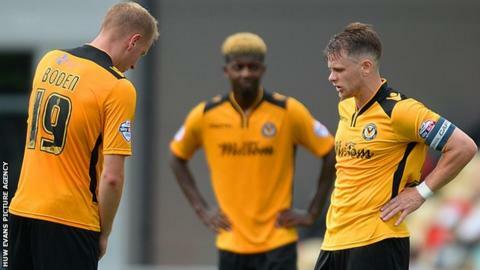 Newport made an awful start on Saturday, conceding two goals in the opening seven minutes. They clawed their way back with two goals in as many minutes from Scott Boden and captain Mark Byrne moments before the break. But Dean Cox scored the winner against the run of play on 59 minutes for Orient to leave Newport still without a win in League Two this season. "These boys are growing together very well," added Butcher, who took over this summer. "We're looking at all sorts of ways of stopping goals going in and looking at ways of scoring goals as well. "It seems we just have to be more ruthless in both penalty areas, it's as simple as that. "It's another harsh lesson for us to take but I'm determined and the player are determined to get the win. "Once we get this monkey off our back by getting the first win, who knows what can happen after that?"